SNOHOMISH COUNTY — Survey takers found Stan at the Snohomish Library, taking refuge from the wet, 40-degree winter morning. The grizzled military veteran was the first homeless person in town surveyed for Snohomish County’s annual Point in Time count Jan. 23. After politely answering demographic questions, Stan shared that he’d spent the night before in an oversized port-a-potty. Curled up on the floor, he’d done alright until someone woke him to use the facilities. Now, poring over a stack of handwritten documents, he debated what to keep and what to discard. There was little room, he explained, for possessions without a home to store them. Stan’s story, of a North Dakota transplant who struggled to find work after following the false promise of jobs here, was one of hundreds told that day. Last year, volunteers found 858 Snohomish County residents without a residence. people they interviewed slept in parks, cars, behind buildings, in caves and under bridges. By the end of Wednesday, more than 60 people had been counted in the Snohomish, Monroe and Sultan areas estimated Mary Wysocki, the east county Point in Time coordinator. But despite tromping through blackberry bushes and navigating slippery mud trails in rural areas and scoping out alleyways and hangouts in the cities, volunteers couldn’t survey everyone. People on the move, those out of sight on buses or at fast food stops, and others uncomfortable with being surveyed, are all missing from the day’s tally. Rather than being a census, this count is a snapshot. The national, federally mandated survey helps legislators understand the demographics and needs of people without stable, safe shelter. People are asked about disabilities, homelessness history, where they spent the night before as well as ethnicity, sexual orientation and more. Even without finding a homeless person to talk to at each Snohomish stop, volunteer surveyors saw firsthand the difficulties of homelessness. On the damp ground under an old wood bridge, a makeshift kitchen showed signs of recent use. A frying pan sat beside an empty packet of instant potatoes and other food debris. A worn copy of “Miss Peregrine’s Home for Peculiar Children,” with its theme of outcasts finding belonging, lay nearby. 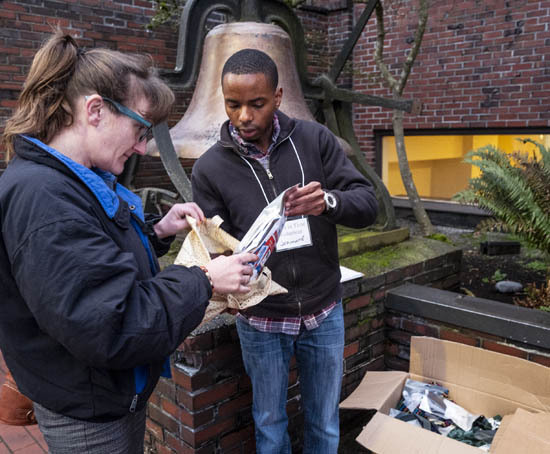 First-year volunteer Jermonté explains the contents of one of the free gifts provided by the Everett Salvation Army to a homeless woman outside First Presbyterian Church in Everett as part of the annual Point in Time homelessness survey held this year on Wednesday, Jan. 23. At Cady Park, a survey team from Volunteers of America, Cocoon House and Snohomish’s Public Safety Commission found three homeless men sharing a bench and beer at the riverfront park behind First Street. One of the men, who said he was called Red, described long stretches of being homeless that spanned 20 years. He spoke about feeling unwelcome, unwanted. When asked the biggest obstacle to ending homelessness, he said governments and churches partnering to create more housing options was one solution. “This is the land of the brave and the great. I’ve been there too, I’ve owned homes,” Red said, but lately, he too had trouble finding work and couldn’t afford rent. With Red was Aaron Ford of Snohomish. Ford said he’d attended Snohomish’s AIM High School but landed in jail and did not graduate. He had trouble since then trying to complete other programs that would have helped him get housing, including mental health treatment. Ford’s wish list was short; a tent and a job. Volunteers offered socks, toiletries and other items for the meantime. services agency that was managing the east county count. Michael Lorio, a coordinator for Take the Next Step, had participated in six prior Point in Time counts. to give volunteers the best chance of success for a thorough count. About 40 volunteers split up into teams to survey Snohomish, Monroe and Sultan, while more than 100 surveyed the rest of the county. Others stayed behind to serve a warm meal to volunteers and homeless people who came to the site for a resource fair. In 2018, Snohomish County volunteers surveyed 378 men, women and children without shelter. Almost as many, 364, had spent the prior night in emergency shelters, and 116 were in transitional housing. The number of people without shelter located by volunteers is up 10 percent since 2013, from 344 to 378. The 2018 count also had more volunteers than 2013. At Cady Landing, Red thanked volunteers for a pair of gloves. He was grateful, too, he said, for the thought-provoking questions about obstacles to being housed. He’d been homeless so many years, it has been a long time, he said, since he’d thought about solutions.